Making music into an object – the central genius of recording – could be a wonderful thing. But the CD was always somewhat utilitarian as a distribution mechanism, with its easily-splintered plastic jewel case and inserted artwork that paled next to the grand visions of the LP. Moldover is the latest artist to experiment with ways of re-imagining the musical object. Already a fan of custom sonic circuitry, he made his CD into a circuit board. Some of it is just aesthetic, like the printed lettering. But there is also integrated noise-making circuitry for a very simple optical Theremin (well, at least, a light sensor-driven oscillator), plus a headphone jack. There’s actually quite a lot of function you can get out of that when plugging into a computer. The album itself is comprised jazzy bleepy jams (in varying proportions). You do pay for this deluxe, handmade circuit goodness. The US$25 “Pocket Edition” seems to be the sweet spot, with a pocketable version of the circuit board. It still has a built-in speaker, turning the jewel case into self-sufficient sonic hardware instead of a throwaway. The $50 version comes with the full custom-printed circuit board for the track listing, but you can’t pocket it, which means you have exactly $25 and one custom Theremin less in your pocket. Who let you out? of your mom’s basement? Go back to building lego trainsets to transport your cocoa from the kitchen to your computer desk. Hey – that’s a great idea, come to think of it. Justifying the musical object can sometimes get ridiculous, but so long as there are genuinely creative ideas that fit the music, I think music may have a more interesting future in the post-industry world than it did before. 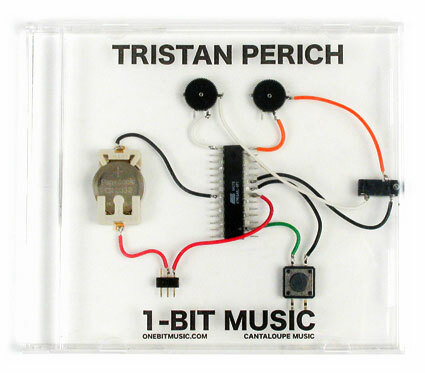 Updated – previous applications of this idea: I’m typing quickly before I head to lunch, and I commit the major sin of not mentioning our friend Tristan Perich’s infamous 2005 release 1-bit Music. Whereas Moldover is turning the packaging into an instrument and inserting a traditional CD, Tristan made the entire jewel box the playback mechanism – the album is embedded in the circuitry, and you listen to it directly. An electronic circuit is assembled inside a CD case with a headphone jack on the side. The device plays back 40 minutes of low-fi 1-bit electronic music—the lowest possible digital representation of audio. We talk a lot about novelty, but my hope is people rip off both Moldover’s and Tristan’s idea here – and invent their own twist on this concept. I’d love to have a shelf full of circuit CDs, instead of dead, silent plastic!